May and June are our most popular seasons for school groups. For many schools it has become the highlight trip to end the year. Many of our teachers and schools come back year after year. It is the closest to the summer camp experience that Camp Kadesh can provide outside a week in July and August. We are able to have full campfires with songs and stories. Team Building Games: TBG are a set of problem-solving activities that require the entire group’s participation to solve. These challenges give the students the opportunity to develop their problem-solving skills, listening, cooperation, communication, and creative thinking. Students will set a goal, plan, discuss, and then participate as a group to accomplish the task at hand. The Whipper: The Whipper functions similar to a large tree-top swing, Students are harnessed securely onto the swing rope while their classmates work together as a group to raise and hold the participant at their desired height. The student participant is then free to gather their courage and release themselves for an adrenaline-fuelled swing. Climbing Wall: Students have the opportunity to harness in and climb one of our two newly-designed climbing runs. Challenge varies by run, but the goal remains the same – make it to the top. Give it your all and encourage your classmates to do their best. For those awaiting their turn, the Bouldering Wall sits nearby for students to practice their climbing skills. Try to get all the way around in one go! Challenge Course: Students move as a group and participate in low-ropes elements designed to test individual, partner, and group capabilities and teamwork. Balance, coordination, and communication are emphasized with each task presenting a new and unique challenge for students to try and master. Time spent at each task varies depending on group dynamics and preference. Marksmanship: Students have the opportunity to be instructed in proper archery technique and shoot in a controlled environment. Bow safety and proper form are emphasized as the students become accustomed to a unique and engaging sport. Students who are awaiting their turn to shoot may be able to engage in tomahawk throwing adjacent the archery range, testing their coordination and consistency under supervision. Canoeing: Students partner up and get instructed in canoe safety and effective paddling techniques before launching their canoes and adventuring on Lake Christopher. Working together as canoeing partners is just as important to success as the paddling competency itself is. This activity is subject to lake and weather conditions. 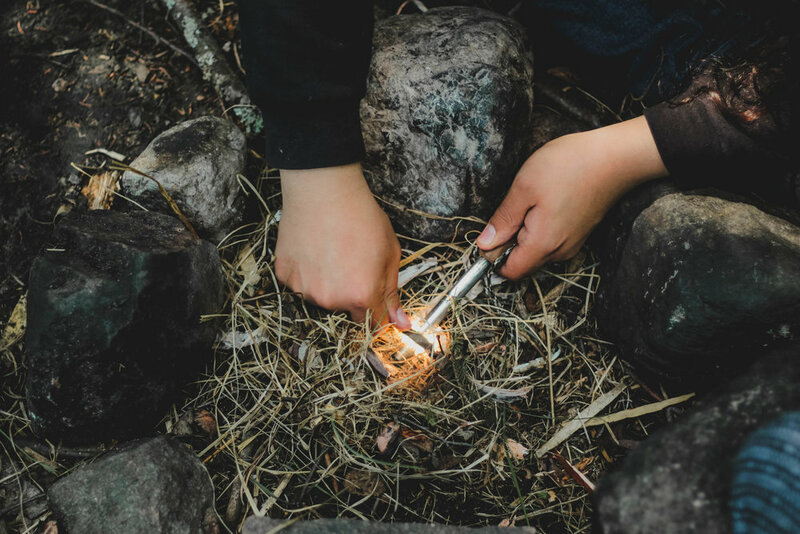 Fire Building: Students are instructed in essential fire-building basics, including types of fuels, use of flint and steel, fire construction, and fire safety. Students then break into groups and are encouraged to start their own fire with materials gathered from the surrounding environment. Ultimate Frisbee: This classic sport uses simple rules and a basic skillset to present an enjoyable game for all students. Done on the camp field, this activity gets the whole class moving and can be modified to ensure full class engagement so nobody feels left out. Beach Volleyball: Students are instructed in essential volleyball skills and techniques, running basic drills before being divided into teams for a game. Friendly competition on the sandy court encourages teamwork and athleticism on a safe playing field. Instructors may add unique twists to volleyball matches to keep things fresh and encourage student engagement. Map Orienteering: Students are instructed on how to read a camp map and are sent out in groups to find landmarks and their associated symbols in a friendly competition. The group that finds and records the most landmark symbols is the victor. May be combined with compass orienteering. Compass Orienteering: Students are instructed regarding compassing basics and how to handle a standard compass for orienteering. Students then break up into groups and follow one of several marked routes throughout the camp using their newly-developed skills. Successful groups may embark on a different route and see how many they can complete. May be combined with map orienteering. Crafts: (Bracelet Making) Bracelet making is an easy DIY craft to pick up! During this block we will explore the different types of braids such as a Chevron, Fishtail, or Diamond weave. Students will have the chance to experiment with the different kinds and have bracelets of their own to take home afterwards. Nature Hike: Take the class on a walk along the paths surrounding Camp Kadesh’s beautiful forested property. Facts and stories about the camp and its wildlife are broken up by established rest stops where group games can take place to get students out and enjoying the scenery. Basketball: Students are instructed in essential basketball skills and techniques, running basic drills before being divided into teams for a game. Friendly competition on the court encourages team work. Instructors may add different basketball games like 21, bump to keep things fresh. Outdoor Cooking: Students will arrive at a warm fire prepared ahead of time by the instructor for the optimal cooking experience. In small groups, the students will work together to collect ingredients and prepare their baked treat before setting it carefully in amongst the embers. Campfire activities and games add some flavour to the day as the fire does its work. This skill ends with a moment to enjoy the results of their work, making this one of camp’s most appetizing skill options. Broomball: For this skill, the basketball court gets transformed into the optimal broomball rink. Use teamwork and mad skills to deke, pass, and shoot your team’s way to victory. Make sure to bring along not only your competitive edge, but also your good sportsmanship to make sure that everyone has and enjoyable time.